Fully extended, this collapsible training sword is 37" long, lightweight, and stable; retracted, the entire sword will fit into a ten inch carrying case. It is by no means strong enough to be used in self defense or in striking practice, but that is not the purpose here. Many people relying on public transportation to get to and from training find that carrying a traditional Tai Chi sword is impractical. The collapsible sword gets you on and off the bus or train without trouble. For beginners, the light weight is a welcome advantage. The slow movements of Tai Chi very quickly show up the weaknesses of modern arms and wrists. Few of us have the natural strength to steady a heavy sword in the air for long, let alone swing it accurately in a slow arc. 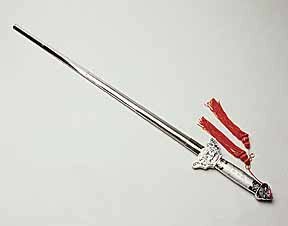 The collapsible sword allows the user to acquire strength and control before moving on to a solid and practical blade. The red tassels attached to the ornate hilt are not simply for show. If you move at a correct and steady speed, those tassels will hang steady in the air -- if they bounce and swing, you just don't have it right yet. Some say they can be used in combat as a distracting device. I used to wear a Tickle Me Elmo kung fu T-shirt for the same reason. I could wear the T-shirt without embarrassment, but red tassels are too much for me; I took them off my own practice sword after a couple of days.